I pick up a new Elizabeth Moon novel with anticipatory delight. In its pages (or phosphors, for the ebook version), I will find fascinating characters with skills and intelligence, subtle conflicts of culture, superbly handled tension and plot twists, and insights into people who are different from me. Unlike the heroine of Into the Fire (and Moon herself), I have no military experience whatsoever (30 years of Chinese martial arts notwithstanding). I was a long-haired, sign-waving war protester. Most military fiction leaves me looking around for those love beads. But not Moon’s, and a big part of that (aside from her sheer story-telling skill) is the intelligence and compassion of her military characters. In the previous novel, Cold Welcome, Ky Vatta and an assortment of people under her command and not-under-her-command manage to survive a shuttle crash into icy waters and make their way to an abandoned base in a frigid, barren landscape. Their survival depends not only working together and making the best decisions but a huge measure of luck. Ky’s training and experience give her a structure to establish leadership and discern what must be done, and by whom, and in what order, how to best use the skills of the others, how to resolve conflicts without squelching initiative. Most of the book centers on how leadership, delegation protocols, the balance between negotiation and creativity and obedience, and the skills to construct and carry out strategic planning can save lives. In fact, there’s very little shoot-‘em-up and a great deal of wow, these people have thought carefully about how to manage desperate situations. Into the Fire continues that story. After the grand finale and rescue, Ky might think her ordeal is over. Ha! Her meticulously collected records of the sabotage go missing and her people mysteriously disappear, drugged and kept incommunicado by forces inimical to her family. The focus shifts from physical to political survival. Sabotage, betrayal, immigration raids, poisoning, and a rescue executed in typical Ky Vatta style build and sustain tension. Again I was impressed by the skillfulness with which Ky and her companions make and execute plans, whether it’s marshalling an academy full of unseasoned cadets to defend the planetary president or nab the drugged prisoners from several different locations. Ky didn’t just jump into action, as characters in many other military novels so often do. She didn’t say, “Trust me, just do what I say” to her subordinates. She conferred with those with expertise, made plans, revised them, revised them again, made backup plans and backups to the backups, made sure everyone had the information they needed to do the best, smartest job. Things went wrong, as of course they must in fiction. And that’s half the fun of the adventure. 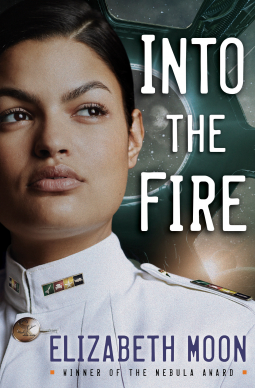 Moon provides enough backstory for Into the Fire to stand on its own, but I recommend reading it together with Cold Welcome. And I do recommend it!